George De Genaro died on August 8, 2018 at home at Bay Plaza in downtown Sarasota. He was 93. His illness was short with wonderful caregivers. George, born in New Haven, Conn., was the sixth child and fifth son of his immigrant parents. At 17 he enlisted in the U.S. Navy in December 1941. With the G.I. Bill he graduated from Wesleyan University and Yale Law School. He practiced law in New York City at Sullivan, Cromwell, Shea & Gould. Retiring in 1989, he studied painting with Arthur Getz, a well-known cover artist for The New Yorker Magazine. George’s paintings hang in homes and galleries and restaurants across America. He and his wife, Mary Jane Lloyd, lived in Manhattan, Greenwich Conn., Roxbury Conn. and eventually Boca Grande before moving to Sarasota in 2000. George and Mary Jane joined the Boca Grande Club in 1985 and moved permanently to the island in 1990. They were active members of the Boca Grande community from 1990 to 2001. George was on the board that purchased the bridge, and as president of the Boca Grande Club, led its purchase. 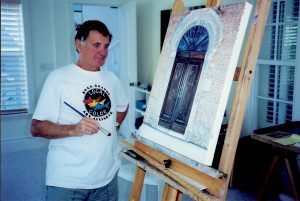 George was also an accomplished painter and member of the Boca Grande Art Center. His work was displayed at local galleries and art shows, including a few paintings that used to hang at The Temp, including one behind the bar. He is survived by Mary Jane; a daughter and two sons; three stepdaughters and 12 grandchildren. A celebration of this wonderful and creative life will be held at 3:30 p.m., Saturday, Sept 1 at Toale Brothers on Orange Avenue, Sarasota.